Access to livelihood opportunities is fundamental to break this cycle. Whilst Pacific Women supports the transition of women into the formal economy, women are likely to continue to work largely in the informal economy. Barriers that women face in benefiting from the economy, particularly the informal economy, include lack of social and legal protections, and the absence of voice in decision-making around policies and legislation.18 This is why Pacific Women seeks to support activities that look at how regulations, policies and services, as well as social norms, affect how women gain from and influence both the formal and informal economies. UN Women’s six-year multi-country Markets for Change (M4C) program is one example of a Pacific Women investment that is supporting women’s decision-making and enhancing safety, as well as building more inclusive markets that promote women’s economic empowerment. The project works on the structural and systemic barriers that constrain women’s full potential, such as gender-blind local government regulations, as well as supporting women’s agency through offering market vendors new skills training in finance and leadership. M4C is one of the number of activities supported by Pacific Women that focuses specifically on the informal sector. Activities that target the formal sector include a Coffee Industry Support Project with CARE Australia in PNG that works at both the structural and individual level, influencing workplace policies in the coffee industry to be more inclusive of women. 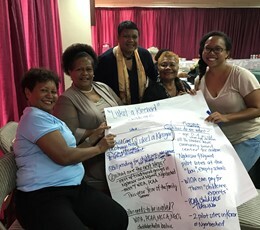 Many of these activities work strategically across multiple Pacific Women outcome areas to better leverage change, most commonly also working in the area of women’s leadership and decision-making. For more information on Pacific Women-funded activities underway with various partners in this area, visit our interactive map. 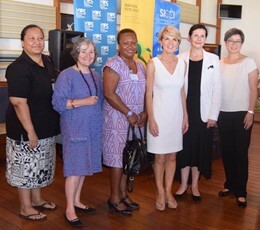 Launched by Australia’s Foreign Minister Hon Julie Bishop in December 2016, the Solomon Islands Professional Women’s Network is a joint initiative of the Solomon Islands Chamber of Commerce and Industry and the International Finance Corporation’s Pacific Women-funded Empowering Women is Smart Business program. In April 2017, stakeholders gathered to validate and inform a Pacific Women scoping study undertaken by the Pacific Community’s Gender Equality Adviser in the North Pacific, funded by Pacific Women. The study analysed the barriers to women’s economic empowerment in Palau. Research on the interconnectedness of women’s economic empowerment and their decision making and safety in the family is informing programming to improve women’s livelihoods. 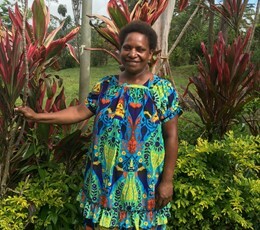 A number of Pacific Women funded projects in Papua New Guinea work with husbands and wives together to change how they relate to each other, allowing women to have more control over decisions that affect their lives. This approach is showing that norms can be changed over a short period of time and that these changes are improving livelihoods and income for the entire family. The Fiji Muslim Women’s League is a non-government organisation that has been operating the Makoi Women’s Vocational Training Centre in Suva since September 2015. 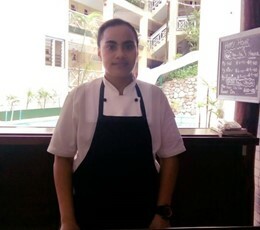 Pacific Women funding supported the roll-out of training courses at the Centre to build women’s culinary, horticulture, tailoring and computer skills. 1UN News Centre (2010). Women’s Empowerment Vital for Economic Development and Peace, Migiro says”, 17 May, citing UN Deputy Secretary General Asha Rose Migiro. 2World Bank (2011). World Development Report 2012: Gender Equality and Development. Washington. 3International Labour Organisation and the Asian Development Bank (2011). Women and labour markets in Asia. 5International Finance Corporation in Partnership with AusAID (2010). Economic Opportunities for Women in the Pacific, p1. 6vi S. Hedditch & C. Manuel, C (2010). Gender and Investment Climate Reform Assessment, Pacific Regional Executive Summary, International Finance Cooperation, p.2. 7OECD (2012). Women’s Economic Empowerment: The OECD DAC Network on Gender Equality. 8DFAT. Development assistance in the Pacific. 9Asian Development Bank (2016) Gender Statistics: The Pacific and Timor Leste. 10AusAID (2012). Women’s Economic Empowerment in the Pacific: Gender Situation Analysis, Australian Agency for International Development, Canberra. 11Asian Development Bank (2016) Gender Statistics: The Pacific and Timor Leste. 12Pacific Community (SPC) Stocktake of the Gender Mainstreaming Capacity of Pacific Island Governments (2012) Papua New Guinea. 13World Bank et al (2013) Papua New Guinea Country Gender Assessment 2011–2012. 14D. Cubers & M. Teignier Baqué (2011), ‘Gender Inequality and Economic Growth’ – background paper for the WDR 2012, as cited in WDR 2012, p.47. 16World Health Organisation & World Bank (2011). World Report on Disability. Geneva. 18V. Nagarajan (2016). Women and Business: Policy options for the economic empowerment of women, p.7.